Comprehensively trained and experienced in many aspects of mechanical fitting, from small to large equipment, Thermalign has the expertise to conduct or assist with plant installations and maintenance. Specialising in rotating equipment, Thermalign has the necessary equipment and expertise to conduct almost every task. Thermalign has experience and expertise in installation of mechanical equipment to a high standard. Installations are carried out to achieve or exceed manufacturers recommendations, to return a high reliability of your equipment. Thermalign hold a number of specialist equipment including; hydraulic torque wrench, manual torque wrench’, hydraulic jacks, measurement equipment, laser levelling, digital inclinometers, remote mount blue tooth dial indicators. 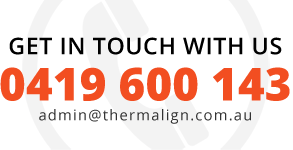 Staff at Thermalign are thoroughly trained and certified in various practises including Confined Space, Woking at Height, EWP and First Aid. Thermalign service vehicle is site compliant to most sites, including mining.